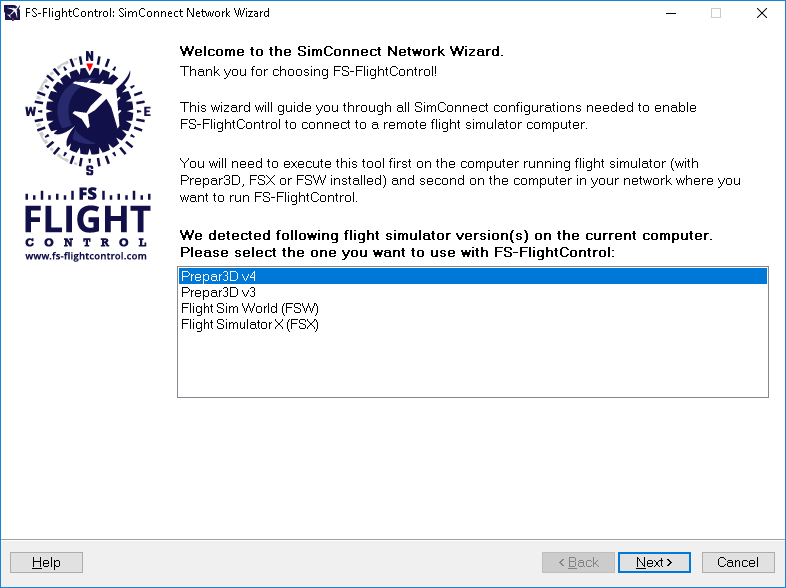 If you want to use FS-FlightControl on a computer other than the computer Prepar3D or FSX is running on, the SimConnect Network Wizard will guide you through everything needed to enable FS-FlightControl to connect to the remote flight simulator computer. Note: This is only needed if FS-FlightControl is not executed on the same computer as Prepar3D or FSX. 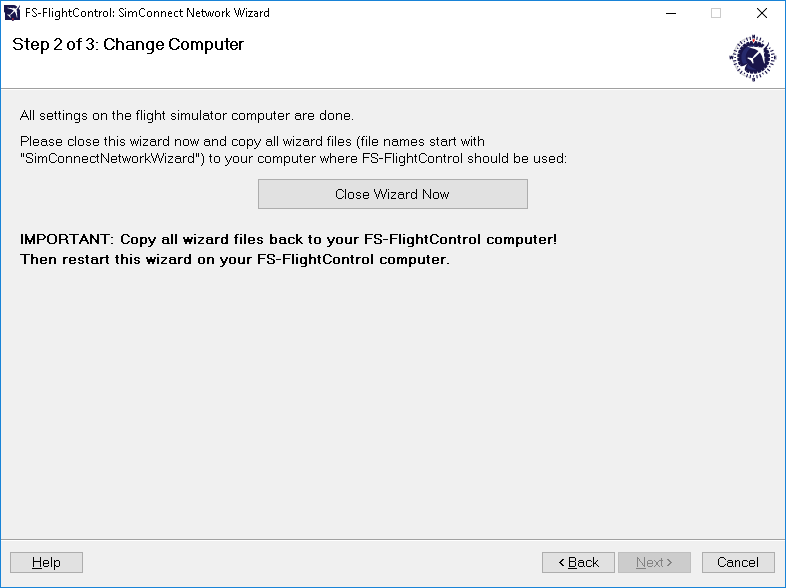 You will find the SimConnect Network Wizard in a subfolder of FS-FlightControl in your Windows Documents or My Documents folder. 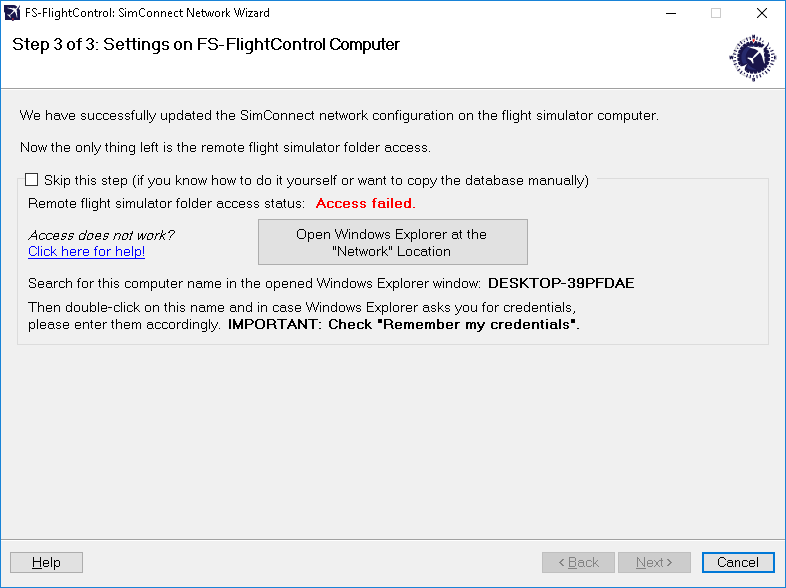 Please first copy all files of the SimConnect Network Wizard to your computer where Prepar3D or FSX is installed and then execute the SimConnectNetworkWizard.exe. After you started the SimConnect Network Wizard this welcome screen will be displayed. In case you have more than one compatible flight simulator software installed, please first select which one you would like to use together with FS-FlightControl. Then please click on the button Next >. On the next screen, the first step in the setup process, all settings on the flight simulator computer are done. 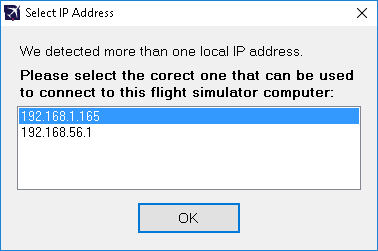 First the local IP address that will be used to connect to the flight simulator computer is being automatically detected and shown. If there is more than one IP address detected the Select IP Address dialog is shown. Next the port is shown which will be used for connection. By default port 2048 is used and you normally don't need to change that. But if this port cannot be used on your system for whatever reason, you can change it here. Now please press the button Update SimConnect Configuration File with These Settings Now to store the SimConnect network settings. In case a SimConnect configuration exists on the computer already, additional settings will be added if needed. Additionally this port needs to be opened in the Windows Firewall. Therefore press the button Open Port in Windows Firewall even if the Windows Firewall is currently disabled. This will make sure everything still works if it gets enabled again later on for some reasons. In case there is more than one IP address detected, this dialog will pop-up asking you to choose the correct one. Note: Only in rare cases there will be more than one IP address detected. So normally everything is done automatically and you do not need to select anything here. But if this dialog is shown and you do not know which is the correct one, try one and if FS-FlightControl cannot connect with that, just run the wizard again and change the IP address. Beside accessing the flight simulator directly via SimConnect, you will also need to build the FS-FlightControl database that contains all the information about airports, navigation aids and so on. To be able to build that FS-FlightControl needs access some flight simulator directories. Therefore you may create a hard drive network share in this wizard step as well by clicking on the button Create Network Share for Hard Drive. You can also do that manually if you want and for this case there is an option to skip this part of the configuration although we recommend to let the wizard create the network share automatically. Note: You may ask why we need to create a network share for the whole hard drive? The reason is that due to the fact that depending on your scenery imports defined in your scenery config file it is likely that there is access needed to (many) more folders than just the two mentioned in the screen. Now everything is done on the flight simulator computer and therefore it is time to go on with the computer that should run FS-FlightControl. Therefore please close the wizard now, copy all wizard files (file names start with SimConnectNetworkWizard) to the computer that should run FS-FlightControl and start the wizard there again. Note: It is important that you copy all wizard files to the other computer as they were changed and contain the connection information needed to setup the FS-FlightControl computer. After you have started the wizard on your FS-FlightControl computer you should directly see this screen. Here the configuration on the FS-FlightControl computer will be applied. As written above already for building the FS-FlightControl database a folder access to your flight simulator computer is required. If you did not skip the corresponding Create Network Share procedure above, you can make sure now the remote access works. To check that please click on the button Open Windows Explorer at the “Network” Location and look for the computer name as shown on this wizard page. Then please double-click on this computer name to access it and in case Windows Explorer asks you for credentials, please enter them accordingly. Note: It is important that you check the Remember my credentials checkbox as otherwise FS-FlightControl will not be able to access the remote folders. After the remote folder access was verified the shown access status should change to Access successful. and you can click on the button Next >. If for some reason you cannot get the remote folder access to work, that is also no problem. The access to the remote folder is only used to build the FS-FlightControl database once and is not needed anymore afterwards. Therefore you can easily work around a folder access problem by just building the FS-FlightControl database on the computer where the flight simulator itself is installed. 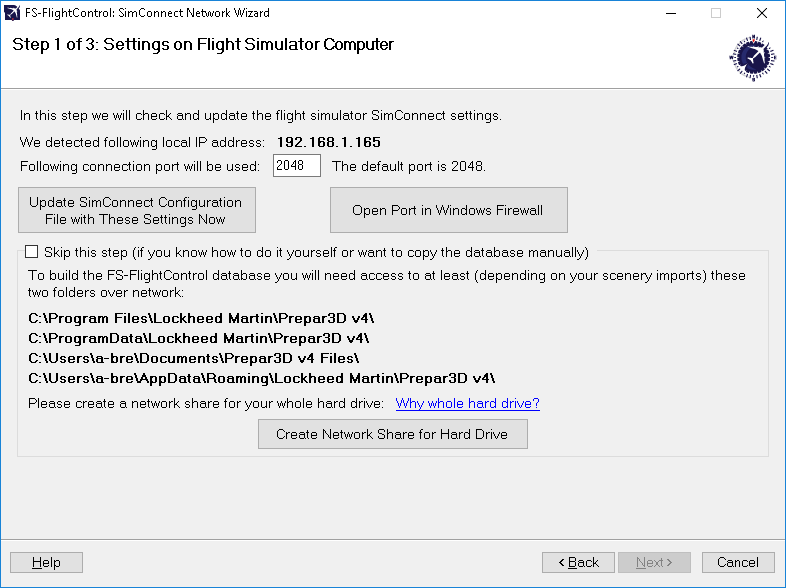 Just install FS-FlightControl on your main flight simulator computer and start the database build there. In the Database Build dialog you will find a small link Open FS-FlightControl data directory in Explorer. Click on that after the build has been completed and just copy the file Database.bin to your other computer in the same FS-FlightControl data directory. After that you should be able to start FS-FlightControl on your remote computer without the need of a folder access to your flight simulator computer. Note: You do not need an additional computer license for FS-FlightControl just for building the database and copy it to your other computer. In this case one license for the computer where you really want to use FS-FlightControl is totally enough. 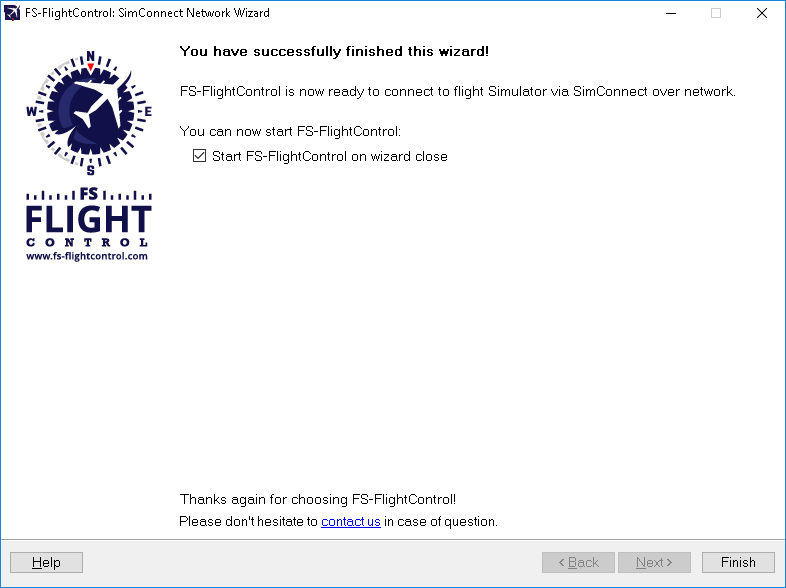 Now all SimConnect configurations are completed successfully and you are ready to start FS-FlightControl!